On the occasion of the 50th anniversary of the establishment of the city of Hikone, the Hikone Castle Museum was opened on February 11, 1987. 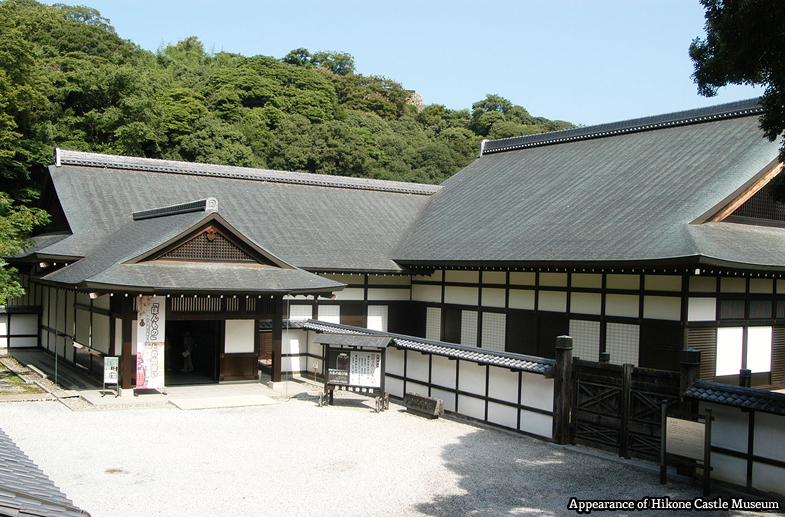 The museum building is a reconstruction of the castle’s Omote Goten (front hall), which used to be the Hikone fief office during the Edo period (1615-1868). With an annual revenue of 300,000 koku of rice during the early modern period, the Hikone fief was prosperous castle town where culture and traditions were fostered. The Ii family – the former daimyo family which governed the Hikone fief for several hundred years – still keeps a great number of art objects and craft works, as well as historical documents, which have been handed down in the family from generation to generation. The family collection comprises more than 45,000 items; ranging from arms and armor (typical of a warrior’s household) to various types of art objects – which include calligraphies and paintings, Noh masks and costumes, Gagaku musical instruments, tea ceremony utensils, and pieces of furniture. In addition to that, Hikone and the Hikone fief related materials have been collected. Copyright © Hikone Castle Museum,. All Rights Reserved.